Mike Young has reached the end of his 2017 international rallying campaign after competing in five different cars, in five different countries, at five different events around the Asia-Pacific region. It culminated last weekend at the final round of the FIA Asia Pacific Rally Championship (APRC) round, the Coffee Day India Rally where Mike and co-driver Malcolm Readcompeted in a Volkswagen Polo supplied by Volkswagen India. While the event was “disappointing” for the duo due to retirement, they still made an impression and provided valuable insights to the team and Volkswagen India for future development. “It was a fun event but really disappointing to have to retire due to a fuel leak on day one. When we retired we were holding second place behind Gaurav [Gill] in his four-wheel-drive Skoda so we were doing really well,” said Mike. Gaurav went on to win his third FIA APRC title this year at the same event, which Mike said was a big achievement and extended his congratulations to both Gaurav and his Team MRF Skoda team, but shows how competitive Mike’s team was. The weekend prior to the Coffee Day India Rally was the World Rally Championship (WRC) round held at the Kennards Hire Rally Australia, where the pair competed in a Citroën DS3 R3 and finished first in the two-wheel-drive class, fourth in the Australia Rally Championship (ARC) field and 17th overall, against some of the world’s best. “Competing in a WRC round for the first time was awesome. It had been a dream of mine since I was a kid so to be able to finally do it was amazing,” said Mike. “Hands down Rally Hokkaido had to be my favourite event. It’s also the home of my long-time sponsor, Cusco who I love working with. The whole team are fantastic at what they do and so hospitable. I really enjoy doing events in Japan with them,” explained Mike. “Plus the Cusco Toyota Vitz was fantastic. I loved the power in it and how it handled, especially on the fast Japanese roads. I would love to compete in that car again,” he continued. 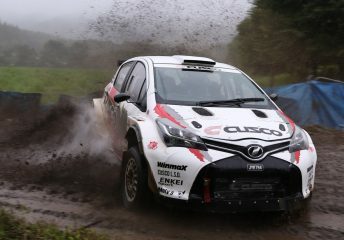 Mike also competed with the Cusco team at the Malaysian Rally, also part of the APRC, in the team’s four-wheel-drive Subaru Impreza where he finished in fourth. “I finally beat the Malaysian Rally again. It is a notoriously difficult event and we’ve been caught out with silly mistakes in the last couple of years so it was awesome to finally get a finish there. The conditions were also terrible this year with rain making the stages incredibly slippery so we were happy to get through that one,” said Mike. The last event on the list of five that Mike and Malcolm competed in this year was Rally Canberra, the second round of the APRC, where they secured a Mitsubishi Evolution to use. Unfortunately brake failure caused the pair to go off-road during shakedown and the subsequent damage meant the car was not repairable in time for the rally. However, Mike is determined to compete in the same event next year and get a result. “We want to use the notes [pace-notes] we wrote this year because they take a lot of time on a new event like that,” laughed Mike. If all that wasn’t enough for the rally-star, Mike also has a part-time job at RallySchool.com.au where he takes rally fans on a hot lap experience, showing them the thrill of rallying while also getting valuable seat time between rounds. Ultimately though, Mike says his rallying campaigns would not have been possible without his group of loyal and dedicated sponsors and supporters who he said are “the greatest”. “I want to say a huge thank you to all my sponsors and supporters who I wouldn’t have been able to do this without. Your support is really appreciated and I hope to bring you more good results next year. Mike is now busy putting together a campaign for 2018 which he hopes will see him compete in the APRC again, along with more international events. He isn’t ruling out competing in New Zealand Rally Championship (NZRC) or ARC events either and hopes to announce plans in the coming weeks. Mike’s campaign is supported by Cusco, Dunlop, Mike Young Motorsport, Yoda Rallying, Excelerate Media, KOS Sunglasses, APSM, and Winnmax.